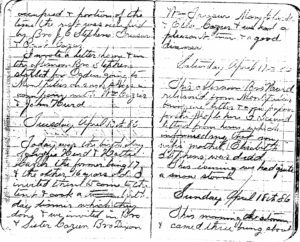 Orson Hyde Eggleston journaled his experience of the settling of Afton Wyoming. Part three covers March to May 1886. Attended meeting after the usual opening exercises and the Sacrament being past I occupied a portion of the time and spoke of the necessity of keeping the commandments of the Lord and the benefits derived therefrom. The snow is now about 2 feet deep. The past week has been more or less stormy. The fore part was nice and warm. Today we had a good meeting most of the time occupied by the young men bearing testimony. Weather warm. Today Bro. Cazier and me went over to Grant Campbells on a visit and stayed over night we stopped on the road over and took dinner with Fred Brown and Jas Dinsdale we enjoyed ourselves first-rate and returned home next day. Weather warm and clear snow about 22 inches deep. This morning the sky was cloudy and continued so during the day. We spent the day reading the news from home and the papers. This morning there was a light fall of snow on the ground. This morning we hitched up and drove over to John Phillip and made a visit till most evening when we drove back [?] miles to Hans Nelsons and stayed over night. This morning we hitched up and drove over to James Jensens and visited him. Stayed with him over night and next day came home. Today attended meeting, time mostly occupied by the young brethren bearing testimony followed by Prest. Cazier. Today was windy and blustery but not cold. 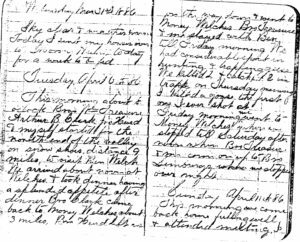 In the afternoon I hitched up my team and took Chas Cazier, Sant Cazier, Isaac Bigler and Ted Oa over to Bro Grant Campbells on their way to Bennington to take the mail. I stayed overnight with Merrick Welk. Returned home Sunday evening. Sky clear and weather warm. Today I sent my horses over to Moroni Hunts today for a week to be fed. This morning about 8 o’clock Bro. 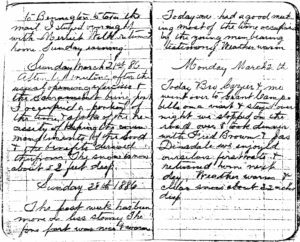 Wm Treasure, Arthur B. Clark Joe Hurd & myself started for the north end of the valled on snow shoes distance 9 miles to visit Ben Welch. We arrived about noon at Welches and took dinner having a splended appetite after dinner Bro. Clark came back to Money Welches about 3 miles, Bro Hurd left us on the way down and went to Money Welches, Bro. Treasure and me stayed with Ben till Friday morning. We had considerable sport in hunting and trapping geese. We killed 2 and catched 2 in traps on Thursday morning I killed a goose the first one I ever shot at. Friday morning we went to Money Welches where we stopped till Saturday afternoon when Bro. Treasure and me came on up to Bro. Semburgs where we stopped over night. This morning we come back home feeling well and attended meeting. I ocupied a portion of the time. The rest was occupied by Bro. J. C. Stephens, Treasure and Prest. Cazier. I wrote a letter home and in the afternoon Bro. Stephens started for Ogden going to Montpielier on snow shoes in company with Wm Cazier and John Hurd. Today was the birthday of Lizzie Hurd and Hattie Cazier the former being 17 the other 16 years old. I invited them to come to the tent and cook a birthday dinner which they done and we invited in Bro. and Sister Cazier, Bro. Dixon, Wm Treasure Mary Clark and Ellen Cazier and we had a pleasant time and a good dinner. This afternoon Bro Hurd returned from Montpielier bring letters and a few papers for the people here. I received letters from home which informed me that my wife’s mother Elizabeth Stephens was dead. This evening we had quite a snow storm. This morning the storm came there being about 1 1/2 inches new snow. Today I moved my tent over on to the town site on my lot and spent the rest of the week in fixing up and hauling over the wood and done some plowing. Plowed some for A. B. Clark and he sowed some wheat the first sowed in the valley. Attended meeting and had a good time occupied a portion of the time myself. Today I commenced to build me a house. Bro. Henry Harmon having charge of the job. Chas Semberg assisting. This week I done some plowing for myself about 2 1/4 acres. Attended meeting time occupied by Sincus Hale and his father and Prest. Cazier. Today I planted some peas and next day some potatoes in a snow storm. The journal ends at this point. Later Orson returned to Utah and brought his family to Star Valley. 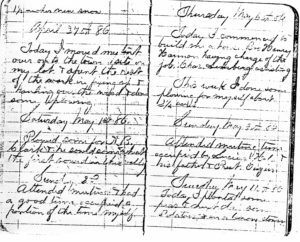 A summary of this journal account is included in The Joseph Eggleston Family: Seven Generations from Joseph (d.1767) of Stonington, Connecticut to Joseph (1885-1965) of Utah and Wyoming, pp. 416-417. 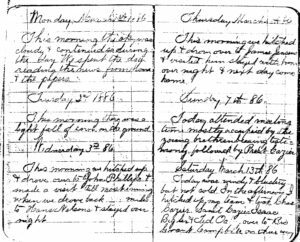 This entry was posted in Family heirlooms, Historical Information and tagged Eggleston, Journal, Record keeping, Utah, Wyoming. Bookmark the permalink.